Ald. 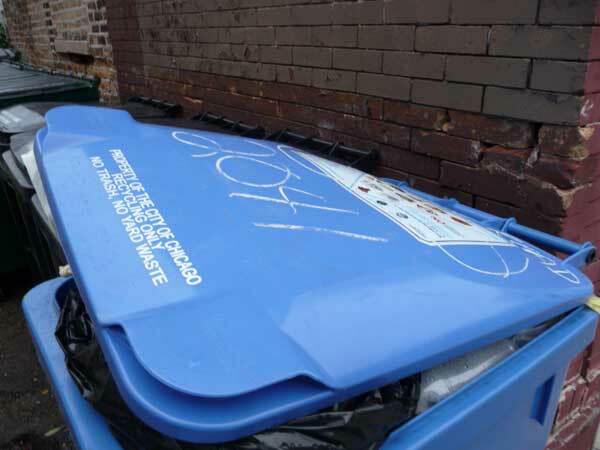 Scott Waguespack announced that the long-anticipated blue recycling carts will be delivered to one- to four-unit residences later this month. This will end the tradition of 32nd Ward residents surreptitiously transferring bags of recyclables to blue carts belonging to their 1st Ward neighbors. The blue carts will be dropped off on the sidewalks; residences are responsible for moving them to the alley, where they will be collected every two weeks. Additional information on how blue cart recycling will work should come with via mail – but if not, details on what can and cannot be recycled are printed on the top of the carts. Ald. Waguespack also has been hosting meetings on the topic; the next is at 7 pm Tuesday at St. Helen School, 2347 W. Augusta Blvd. If you're recycling as you should be, you'll find that your need for black garbage carts will diminish. You’ll also probably notice that your alley, with all these additional blue carts, will get crowded. If you have black carts you don’t need, contact the alderman’s office, the ward superintendent’s office or 311 to have them removed. If you want more blue carts than the city gives you, you'll have to give up one of your black carts.  Plastic bags cannot be recycled in the blue carts. They must be returned to the plastic bag recycling containers at stores. Better yet, use reusable cloth bags and avoid plastic bags altogether. When in doubt, don’t put things in your cart that you're not sure can be recycled. Removing these “contaminants” adds to the cost of recycling, or may result in a truckload of recycling being rejected altogether. The most common items put in carts that cannot be recycled as part of the Chicago programs are clothes and non-approved plastics such as clear plastic food containers. Yard waste should not be put in either black or blue cart. It needs to be bagged separately, and left by the carts for pickup.